The 64th AGRS is assigned 24 F-16C Fighting Falcon aircraft, painted in camouflage schemes identical to those observed on Russian-manufactured aircraft providing Air Combat Maneuvering training to USAF and other aviation forces in conjunction with Red Flag exercises. The unit operated in conjunction with the 65th Aggressor Squadron, which performed a similar task using F-15C Eagles until it was disbanded in 2014. The squadron was first formed as a P-40 Warhawk pursuit squadron in January 1941 as part of the Army Air Corps Northeast Defense Sector (later I Fighter Command) at Mitchel Field, New York. It trained in New England and provided air defense of the northeast after the Japanese attack on Pearl Harbor. It was reassigned to the U.S. Army Middle East Force in Egypt, July 1942, becoming part of IX Fighter Command. It took part in the British Western Desert Campaign, engaged in combat during the Battle of El Alamein and, as part of Ninth Air Force, supported the Commonwealth Eighth Army's drive across Egypt and Libya, escorting bombers and flying strafing and dive-bombing missions against airfields, communications, and troop concentrations until Axis defeat in Tunisia in May 1943. The unit participated in the reduction of Pantelleria (May–June 1943) and the conquest of Sicily (July–August 1943). In 1944, the squadron converted to P-47 Thunderbolt aircraft and flew interdiction operations in Italy. It moved to Corsica on 30 March 1944 to operate as a separate task force, and flew interdiction missions against railroads, communication targets, and motor vehicles behind enemy lines, providing a minimum of 48 fighter-bomber sorties per day. The squadron participated in the French campaign against Elba in June 1944 and in the invasion of Southern France in August. It engaged in interdiction and support operations in northern Italy from September 1944 to May 1945. The 64th flew its last combat mission on 2 May 1945. It remained in northern Italy after the end of the European War, demobilizing throughout the summer of 1945. It was reassigned to the United States in August 1945 without personnel or equipment and was inactivated at the end of August. Reactivated in August 1946 as part of Eleventh Air Force (Later Alaskan Air Command) as part of the air defense forces in the northwest Pacific. It provided air defense initially in the Aleutian Islands, then moved to Nome in early 1947 and to Elmendorf Air Force Base in the fall of 1947. Initially flew P-51 Mustangs, then became equipped with F-80 Shooting Star jet aircraft in 1948. Reassigned to Alaskan Air Command 10th Air Division and became a permanent part of the Alaskan Defense Forces throughout the 1950s, upgrading to the F-94 and F-89 dedicated interceptors. Was reassigned to McChord AFB, Washington in 1957, upgraded to F-102A Delta Dagger as part of the 25th Air Division, 325th Fighter Group. Provided air defense of the Seattle area and the Pacific Northwest until 1966. Was deployed by Air Defense Command to Clark Air Base, Philippines in 1966 as part of Pacific Air Forces to provide air defense of Luzon and northern Philippines. Flew F-102s from Clark, and rotated flights to bases in South Vietnam (including Da Nang Air Base) and Thailand to provide air defense against the unlikely event that North Vietnamese aircraft would attack, July 1966 – December 1969. Deployed temporarily to South Korea during the Pueblo crisis in January–June 1968. Inactivated in 1969 as part of the retirement of the F-102. Activated within th 57th Fighter Weapons Wing on 15 October 1972. Initially equipped with T-38A Talons, upgraded in April 1976 with Northrop F-5E Tiger II export fighters having been originally destined for delivery to South Vietnam and became available when the South collapsed. Since the F-5E had approximately the size and performance characteristics of a Soviet MiG-21, it was used throughout US and overseas to teach adversarial tactics and provide dissimilar air combat training to US Air Force flying units, eventually becoming the 64th Aggressor Squadron. F-5s carried no tail codes, although they did carry Nellis black/yellow check tail stripe and TAC emblem on tail. Aircraft were painted in Soviet Air Forces motif, with subdued USAF markings. The last two digits of the F-5's tail number were painted in red on front fuselage, highlighted in white. From October 1972 to June 1990, deployed throughout US and overseas to teach adversarial tactics and provide dissimilar air combat training to US Air Force flying units. Re-designated 64th Tactical Fighter Aggressor Squadron on 30 December 1981; re-designated again as 65th Aggressor Squadron on 4 January 1983. Added subdued "WA" tail code in early 1987. 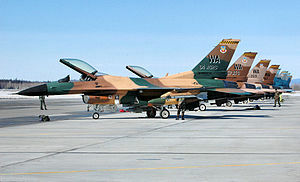 Wikimedia Commons has media related to 64th Aggressor Squadron. ^ a b c d e Robertson, Patsy (July 30, 2009). "Factsheet 64 Aggressor Squadron (ACC)". Retrieved October 10, 2017.